The Saab Safir was designed by Anders J.Andersson who had been the chief designer of the famous Bücker Jungmann, Jungmeister and Bestmann in Germany during the thirties. He came back in his homeland during 1939 and we can see that here is an obvious linkage between the Bestmann and the Safir. First flight happened on 20 november 1945 powered by a Gipsy Major. The production was launched for the Swedish and Ethiopian Air Forces as the 91A. More powerful version 91B with a 195hp Lycoming O-435A boosted the sales and a production line was established in Netherland with De Schelde company in 1951. Production ceased in 1966 when 323 Safir had been built of whom 48 were 91A. 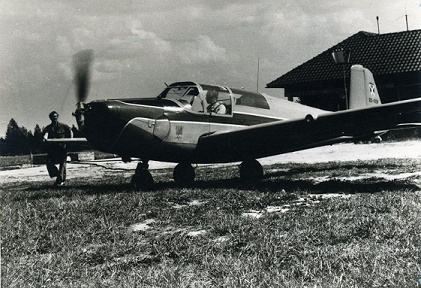 In Belgium, 8 Safir 91B were used between 1953 and 1957 by the Belgian Civil Aviation School managed by SABENA at Grimbergen. 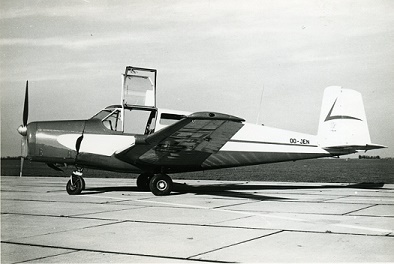 Registered OO-JEN on 16 september 1960. Currently in restoration to flying conditions following an incident. Normally based at Grimbergen.